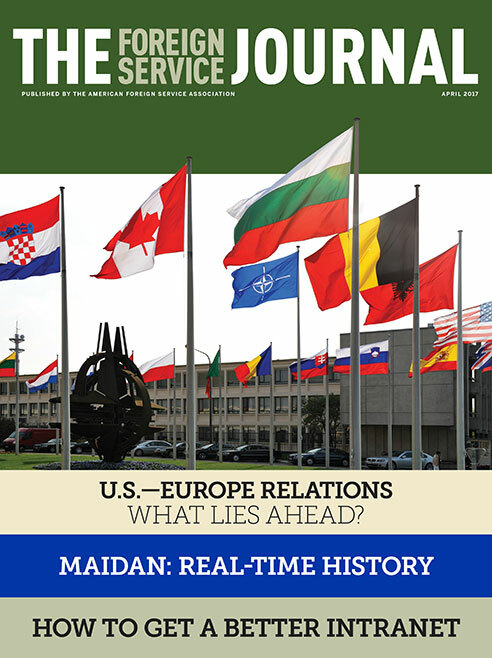 The April issue focuses on U.S.-Europe relations. Both Europe and the United States have a vital stake in preserving and improving the trans-Atlantic relationship. The questions hanging over the E.U.-U.S. relationship are made all the more daunting by Europe’s own difficulties—economic stagnation and a demographic crisis. Globalization and digitalization present as fundamental a challenge to the U.S.-European alliance as the task of rebuilding after World War II. During the mid-1960s, as tensions grew between the United States and Europe, many sought a re-evaluation and updating of trans-Atlantic ties. Embassy Kyiv’s oral history project will prove useful to historians and may be a model for other posts interested in instituting “exit interviews” of departing staff.